While the rematch between Demetrious Johnson and Ian McCall wasn’t enough to pique Floridian’s interest enough to attend Friday night’s show, there was one flyweight sitting in a Los Angeles studio whose eyes were fixated on the shootout. 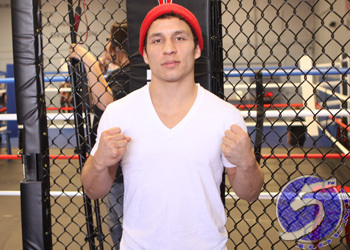 Now that Joseph Benavidez (Pictured) knows he will battle “Mighty Mouse” to see who becomes the UFC’s first 125-pound king, he’ll take his extensive notes back with him to Team Alpha Male and conjure up a championship strategy. “Demetrious has always impressed me and [Friday] he impressed me even more. He improves every fight and [last night] he looked the best in this weight class,” Benavidez revealed while serving as an analyst on FUEL TV’s post-fight show. “We are the two best guys in the world and he is going to be good at everything and I’m going be good at everything. Johnson joined the broadcast following his unanimous decision victory over McCall. To the surprise of no one, he and Benavidez were tightlipped when asked what their game plans for each other would look like. So, the only imperative question remaining – outside of what the Benavidez vs. Johnson betting line will be, of course – is when will the flyweight tournament finals go down? Unfortunately, UFC president Dana White wasn’t able to commit to a specific date. Although, he knows sooner rather than later would be best given how the injury bug has ravaged his roster.